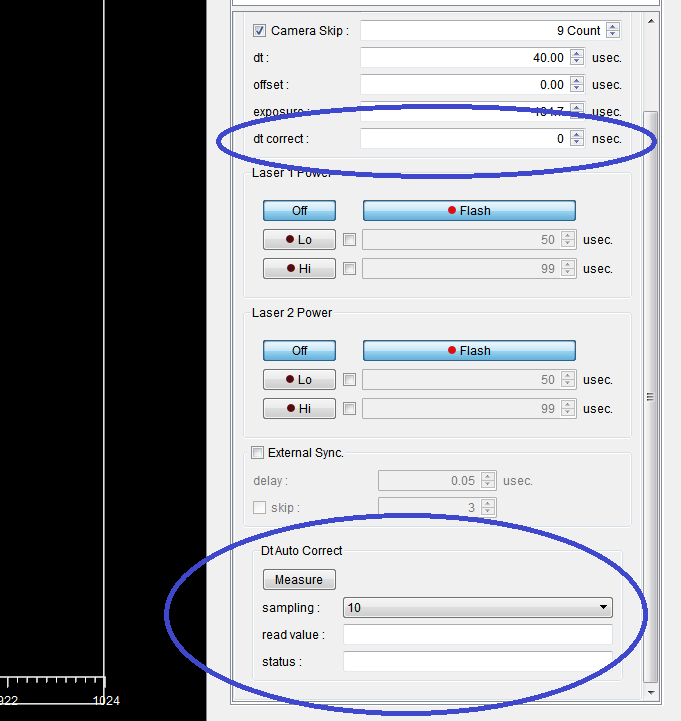 PIV system variation | SEIKA Digital Image Corporation. Many types of PIV systems, such as standard 2D-PIV,Stereo 3D-PIV, micro PIV, Time resolved PIV, etc., are available. Each system consists of different components. The integrated PIV software Koncerto controls all the components and analyze the velocity field. The 2D-PIV system measures the in-plane two-dimensional velocity component irradiated on the laser light sheet. Frame Straddling allows for all speed ranges. Moreover, with the latest PIV analysis algorithm, it is possible to accurately analyze a wide range of speeds from low speed to high speed at the same time.It is compatible with various types of cameras and laser equipments, making it possible to construct any type of PIV system.Capable of measuring 2 velocity components (u and v) in a plane defined by the laser light sheet. It consists of a double pulse laser, a double shutter camera, BZ-60 light sheet optics, TT1680 timing controller, Koncerto software, and PC. Typical time resolution is 10 Hz. High-performance analytic algorithms typified by deformation correlation and the latest analytical techniques such as phase filters that demonstrate the power to analyze the boundary layer are abundantly included. By using the timing controller it is possible to synchronize the pulsed laser and PIV camera with high precision. Capable of measuring all 3 components in a plane defined by the laser light sheet. It consists of the second camera, Scheimpflug camera mount, calibration target in addition to the 2D-PIV system. Typical time resolution is 10 Hz. In the stereo three-dimensional PIV, it is possible to measure three components of velocity in the light seat surface. Since flow is a three-dimensional movement, absolute value can be known by measuring three components. In the stereo PIV, you can place two cameras freely. Besides the basic arrangement that installs two cameras on one side with respect to the laser light sheet, it is also possible to arrange them on both sides of the laser sheet by sandwiching. Since there is no problem even if the installation angle of each camera is different, there are merits such as arranging the camera avoiding obstacles and measuring the wider area by using forward scattering. Scattered light from fine particles with a diameter of several microns is called Mie scattering, and the scattered light intensity differs greatly depending on the scattering direction. The front of the light source is particularly strong, and there is a place where the luminance is high even in the diagonally backward direction. For forward scattering, much stronger scattered light can be obtained than 90 degrees side scatter. 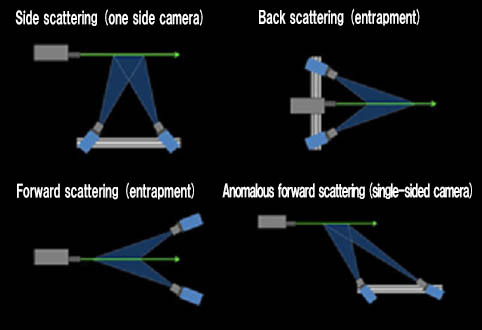 In the stereo PIV, it is possible to measure a wide area by placing a high resolution camera in a position where it can receive forward scattering. Capable of obtaining very high time resolution up to around 50 KHz. A high speed video camera and a high repetition rate pulse laser are used. Algorithm developed for time series PIV, it is possible to analyze temporal speed fluctuation frequency and disturbance in each grid of PIV, highly accurate spatiotemporal validation, etc. For microfluidics such as MicroTAS, Lab on a chip, etc. An optical microscope is used. Piezo electric focus scanner is available. The probe PIV is a 3D-PIV system in which two cameras are installed in the BOX and the laser and the camera are integrated by transmitting the laser with the fiber. It is unnecessary to adjust Shine Flag · Focus adjustment, Laser sheet adjustment, User calibration like ordinary 3D-PIV system.In addition, since calibration is performed during maintenance, calibration by the user is unnecessary. Any inquiry or request for information,please click here.